It is nice to be back home after almost two weeks in Santa Fe. But it was beyond depressing to be at my parents’ house which, now that it is rented out, is still their house but it isn’t their house any more. It sort of isn’t anyone’s house, the renters aren’t really renters, they are “home tenders” who are supposed to keep the house in tip-top condition for showings since it’s on the market. Well, there are no showings, the market for larger homes continues to be terrible, so it doesn’t matter. It was fun to be back and see old friends, eat at some favorite old places and a couple of new nice ones, but the reality that faces us is that like so many people, my parents thought that leaving us their house would turn out to be a really nice inheritance, and as it turns out we can’t even sell the place for half its appraised value. You have to be honest about these things – we spent every cent they had on their care and they couldn’t have had any better care even if we’d installed them in the Georges V, at the end. But there really wasn’t anything left in their accounts, the house isn’t selling and we are reluctant to reduce its sale price even further (especially since in order to fix it up to be presentable for sale we had to spend a lot which we will have to repay). And so it goes. Then we come back here; of course our house hasn’t sold either, so we are stuck. We see houses for sale that intrigue us and think how much fun it would be to be in one of those, then we realize that of course until this one sells we haven’t got the money to put into that one. Very few showings, because as is the case up north, there are very few buyers out there. Everyone says it’s better, it’s getting better, but we, at least, haven’t seen the effects of whatever improvement there is in our own case. The house looks great, people seem to like it, but – well, no sale. One tries to be optimistic but the whole project of finding a different house could realistically take a couple of years. I guess we just have to be really, really patient. Arnold also had to have another stent put in. 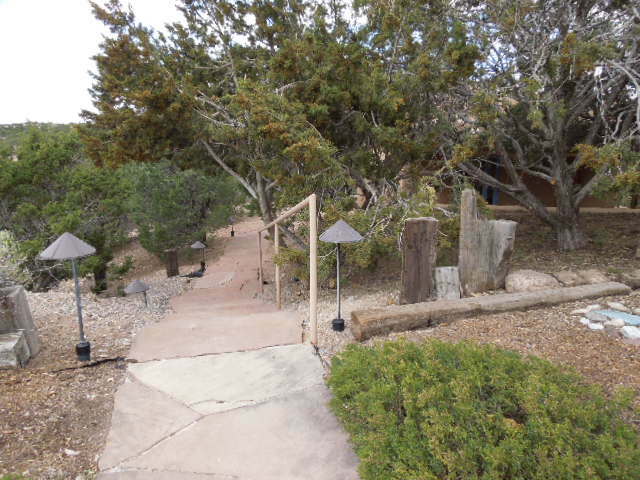 We told Dr. Briseño, his wonderful cardiologist, that we had to make this quick trip to Santa Fe to meet with our attorney and begin the depressingly final unwinding of my parents’ estate – what’s left of it – and tend to a bunch of repairs to their house. His response was “okay, but the second you get back here I want to see you in the hospital to see what’s causing your symptoms.” Being in Santa Fe at 7,000 feet didn’t help and Arnold basically went flying in to the Hospital Mexico-Americano to have a stent put in the second we got back home. He’s fine, but the whole trip and the few days before we could schedule the procedure were stressful for both of us. So, you’d think that this would be a really nice time to just escape and have an adventure and run off to Paris or something. We actually have the mileage to do something crazy like that and no one could blame us, as we’ve spent the past decade, really, pretty much focused on parent care. But the Mexican government has decided to change all the visas around for foreigners, with new requirements, new required financial assets that must be documented, a pile of financial statements for the past six months, all translated by a certified translator into Spanish. And they decide whether or not you can stay, according to a bunch of complicated new formulas, none of which is all that clear as this legislation is relatively new and still being interpreted by lawyers and notarios all over the country, causing many who are in the lower income brackets to panic. Before our visas actually expired the other day, we had to turn a huge stack of papers, along with a hefty check and our old visa cards in to our attorney to have her navigate the whole “new visa” process for us. The confusion and varying interpretation of the labrynthine new immigration rules have meant that there is a backup of three months or so to get the new visas “en la mano” – in hand. So at least for this summer, whatever we do will have to be within the Mexican republic. Oh, we could get out all right, just with our American passports …. we just couldn’t come back home. There actually IS a workaround for it but I am just looking for an excuse to stay home for a couple of months and not do anything, so I am pretending that there is nothing that can be done, we’re stuck here for a couple of months, and what am I going to do with myself till we can head off somewhere? House hunting is at a standstill, everything that needs to be done in Santa Fe is being handled, so I am returning to my exercise program and trying to disentangle myself from the mental seaweed left by years of putting everything connected with my parents and their care first, and myself, in most cases, last. It is much harder than I thought it would be and much of the time I still feel exhausted. I know, I know, I shouldn’t complain, but once in a while perhaps it is good to admit that one is completely fried by the goings-on of the past few months. Nothing a summer of lazing around won’t cure, I am sure.